As I walk the streets of the French Quarter, flowered cast-iron galleries hanging over narrow roads, I know what he means. So much of America has been paved over by progress. New Orleans refuses to comply. It’s gritty and sensual, something not just to be visited, but devoured with lips, ears and tongue. Voodoo and hoodoo, the bite of the snare drum, poboys — traditional Louisiana-style sandwiches — dripping with alligator sausage and gravy; there’s a spirit here that soaks into the soul. It’s a good time to come too. 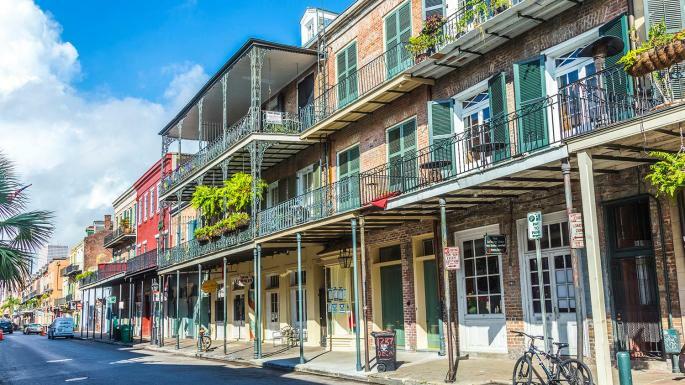 At the end of March British Airways launches the first direct flight from London to New Orleans, so reaching the city they call the Big Easy — nicknamed because of its relaxed way of life — just got easier. Locals call it the northernmost outpost of the Caribbean for a reason. New Orleans isn’t about fashion, careers or industry. It’s about music, food and fun. It’s about extracting every last drop of honey from life, putting it in a glass with ice and adding some bourbon. I planned to neck mine in one. I started with the music. Bourbon Street is raucous — a 13-block frat party filled with fishbowl-sized cocktails, semi-clad dancers and a “preacher” with a fake monkey on his back screaming at me to “turn off the one-eyed demon”. It was like speed dating for gigs or binge-drinking music; I had cocktails at a honky-tonk, beers with some blues, and a whiskey tapping my toes to a blind piano player. The angel on my shoulder was horrified, the devil ordered another round. Frenchmen Street is more manageable; same festival atmosphere, same bouncing between gigs, but with better music and a more local crowd. However, it’s what you’re not expecting that really hits you. Next morning I followed the curled brass of a trumpet solo through the winding cobbled streets of the French Quarter, along the levee of the Mississippi, past the former home of Marie Laveau, New Orleans’s infamous 19th-century voodoo queen, until I found them: nine teenage boys on trombone, tuba and snare, playing as if their lives depended on every note. Say what you will of jazz, but this was handclapping high-spirit music, music with its fists up. It was the middle of the day, they were using an old paint bucket for tips, but it was hands down one of the best gigs I’ve seen. That’s what makes this city great. Music is only part of the indulgence. 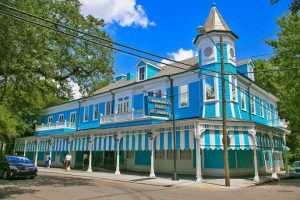 Brunch is like church here, but better attended: caramelised grapefruit brûlée and an “eye-opener” of Caribbean milk punch at Brennan’s; Creole bread pudding soufflé and live jazz at Commander’s Palace. I had spicy seafood gumbo for lunch, jambalaya for tea and a flaming café brûlot that made after-dinner drinking look like an extreme sport. The cocktail scene is exploding too. At Loa, one of the best bars in the city, I sipped tequila mixed with backyard plantains and apple liqueur, infused with local sugarcane. It was like drinking New Orleans itself. Then a highlight. Down a dark alley on the outskirts of town, the kind of place where the hairs bristle on the back of your neck and darkness looms from every corner, I was invited to enter a Hounfour, an authentic working voodoo temple. Inside, the congregation were dressed in white, with white bandanas wrapped round their heads. Altars covered each wall with offerings of rum, candy and wine. The true religion of vodou — as it’s properly termed — is a fusion of indigenous beliefs brought over by slaves from Africa and Haiti, and the Catholicism of the New World. Analogous to Catholic saints, practitioners of vodou honour ancestors’ spirits through ritual drumming, song and trance. Far from the black magic of Hollywood, however, the purpose is healing, protection and serving the community. Candles were carried to each of the four cardinal directions to purify the room and a veve, or sacred drawing, was traced in cornmeal on the floor. Then the singing began. The hounjenikon, the leader of the choir, called out in Haitian French, a solitary melody, answered in turn by voices in the darkness. He sang to Papa Legba, the gatekeeper of the spirit world, to open his doors; to Papa Loko, the first houngan, or vodou priest, whom we honoured that night. Gradually the singing intensified, solemn notes piercing the blood-red light of the candles. The room started to sway, bodies rolling with the beat, voices chanting, the sacred ason (gourds) rattling like snakes in the shadows. It is, I thought later, a personification of New Orleans itself, an improvised riff created from the clash of two opposing worlds, a religion based in song. It’s more than that too, though. “It was a piece the slave owner could never take from us,” Robbie Gilmore, a young vodou priest, told me. “It was survival.” Calling it black magic is just another kind of chains. 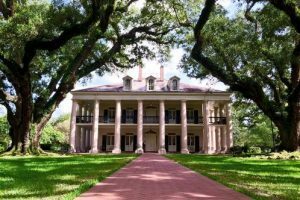 I left the city the next day and followed the Mississippi west for 50 miles to Oak Alley Plantation. Named after a spectacular row of 300-year-old southern oaks, which arch across the entrance promenade like fingers clasped in prayer, this French Creole-style mansion, built in 1839 by the Roman family, is as elegantly beautiful as it is harrowingly sad. Inside is Italian marble, fluffy beds, polished tables with fine silver and china. Yet in its shadow the slave quarters still stand, tiny shacks built for two families, ten people, each. No sanitation, never enough food, 14 hours a day in the field, burning all summer, freezing all winter. About 220 slaves cared and worked for this one family: farmers, wet nurses, the eight-year-old boy who pulled the fan to keep the flies away. I walked the grounds at dusk and found the register of their prices: $1,000 for Rose and her two children; $50 for Louis, who had lost an arm in the fields. I discovered their stories: Anna, who burnt her arms every day on the chemicals she used to make soap; Zephyr, who was granted his freedom but chose to stay because his wife and children were still owned. There is much to do outside the city. I took a swamp tour deep into the bayou and learnt how the Acadians, exiled from France and kicked out of Nova Scotia, managed to thrive in these murky tributaries, hunting deer and raccoon for skins, trawling for crawfish and foraging Spanish moss for pillows and scouring pads. I stared an alligator in the eyes, watched the paddle wheel spin on a Mississippi steamer and took an airboat out on the Atchafalaya Swamp, the largest river swamp in the country, with wild daisies, herons and the stumps of cypress trees as far as the eye could see. It was the music of New Orleans that kept drawing me back. On my last night I stopped at Preservation Hall, a living-room-sized concert venue set up in 1961 to keep traditional New Orleans jazz alive. It was like watching a gig in a squat; no amplification, crumbling walls, barely any lighting. Then the music started. Shining brass and backbeats, old boys shouting out to each other, stomping their feet, flaring solos — tough, hopeful music, music from the depths of the plantation to the gritty city streets. 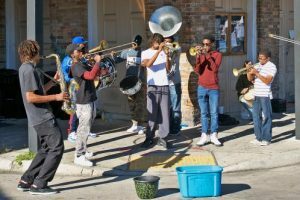 Louis Armstrong, who grew up in New Orleans, said: “My whole life, my whole soul, my whole spirit is to blow that horn.” That’s what the city’s about. I closed my eyes and let the spirit of New Orleans soak into my soul. The co-owner Ti Adelaide Martin wrote a book on the history of cocktails, and if you meet her at the Land of Cocktails bar by the aqua blue restaurant, you’re in for a treat. “This is a big girl’s drink,” she says of New Orleans’s most famous cocktail, the sazerac, a mix of rye whiskey and Herbsaint, with dashes of bitters and a twist of lemon, which some hold was the first-known cocktail. “Just have one — you are not nearly as attractive as you think you are if you have two,” Ti says. Also try a Blood and Sand, with flambéed lemon skin. Cocktails are $9-$12. There’s a jazz brunch every Saturday and Sunday from 10am-1.30pm for $35, otherwise two-course lunches are $16. And if you get bored of cocktails, there are 45 wines by the glass (commanderspalace.com). You’ll need to reserve a table well in advance if you want to try Shaya’s delicious, modern Israeli food. Order five sharing plates for a total of $23 and tuck into everything from baba ghanoush to wood-roasted brussels sprouts (shayarestaurant.com). 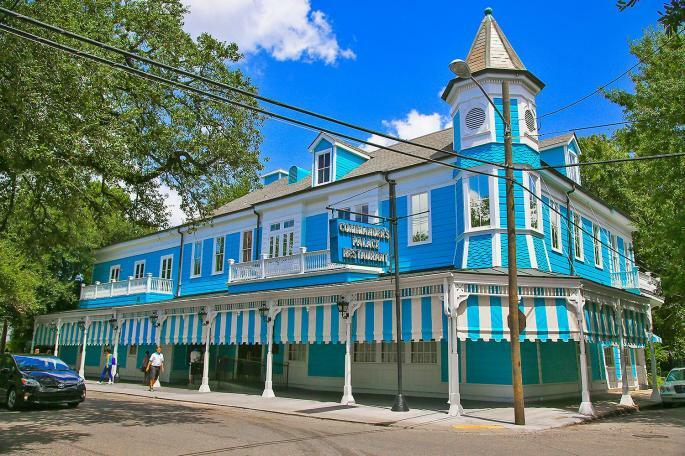 Opened in 1918, and beautifully restored, Arnaud’s is a New Orleans institution. This is fine dining Creole style, with starters including alligator sausage and shrimps marinated in a remoulade sauce, and mains reflecting the city’s French heritage, including filet mignon and frog legs provençale ($27.95, or £22.50). Before you eat, sip a French 75, a mix of champagne, cognac, sugar and lemon named after the field gun, while jazz musicians strike up in the corner. 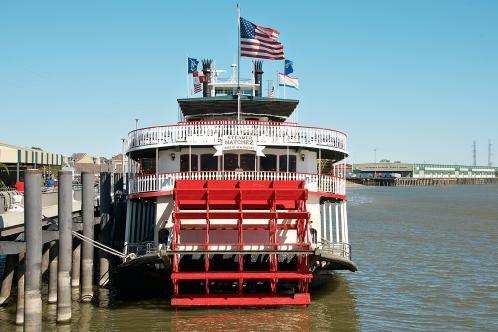 Be sure to take a look around, from the windowless speakeasy bar to the Mardi Gras museum (arnaudsrestaurant.com). 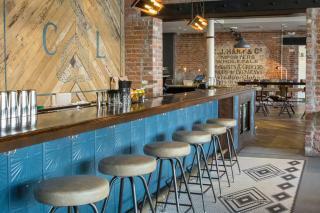 In this atmospheric restaurant and bar, with its bare brick walls and tiled floor, the bartender Abigail Gullo will regale you with the history of New Orleans cocktails (“My favourite cocktail is yours because I’m making it for you”). Try the Andromeda, with pisco, green-chilli vodka, lime and grapefruit; but think twice before ordering the Harry Ramos Gin Fizz because it needs to be shaken for 12 minutes. Cocktails are from $10-$12 (comperelapin.com). There are quirky touches in this rustic interior — a chandelier here, a bicycle there — as well as some tasty, fresh seafood. There’s gumbo, oysters and Louisiana shrimp roll to pick from (mains are about $26). If you happen to go on a fishing trip and strike lucky, you can take your catch here and they’ll cook it for you, too (pecherestaurant.com).